If one follows the alternative news and hears all about what the dark ones are up to these days, it almost gets overwhelming where you feel like why bother, how the heck can we fight against this insanity, but we must! They may have the guns and evil military warfare machines designed to maim, stun, or kill us if we should decide to fight back, but we have the light and the frequency they are unable to capture and become a part of. Light and love are our only weapons, yet we stand an excellent chance of overcoming this darkness with them. Stay off their frequency and stay safe. We can do this and we will do this with hard work and determination. It is obvious that they are desperately trying to keep the fear factor humming in the air and the frequency lowered in the masses by all of their activities. Not for me say I, what say you? They may be humming the fear frequency, but we are singing loudly the love frequency and we must continue to raise the volume until it shatters their eardrums. I don’t know if people are connecting the dots of love and gratitude and frequency. We know everything on the planet has it’s own frequency it vibrates by and some are very pure and high vibrations like love, roses, honesty and gratitude, while some frequencies vibrate slowly like fear, greed, lying, control etc. They are opposing frequencies and unable to function in the same space. You either feel love or you feel fear, you cannot feel both at the same time. If the majority of the planet is vibrating at a high frequency, then just like the hundredth monkey theory, everyone will follow the masses and join in to the higher frequency. The good old herd mentality. Herein lies the battle, will the light get to the mass thinking first or will the darkness? This is why it is so important for everyone to wake up, become centered in our hearts and start vibrating at the higher frequency, as far a winning the battle is concerned. With that said I must also point out that staying in our hearts being loving beings and feeling gratitude for all of life and deep respect, is also the way of life in the new world we are headed to. This is how life is meant to be lived but we got lost along the way and fell into the evil hands of the dark ones. Life is meant to be happy and free and a manifestation of peoples loving desires, it is not meant to be anything like what we are living today. We are living in a prolonged episode of the twilight zone where reality is not the real reality. We all learned over our lifetimes that children learn by example and I think all people learn by example as well. This is how we must awaken others. For those out there not willing to listen right now, eventually they will learn by example, therefore it is up to each of us to live our lives from our hearts, to reach out to others, to be loving and compassionate, to always look upon the positive side of life. These acts produce a frequency they will either run away from or eventually switch over to to be accepted by the masses. Living this way is a powerful and rewarding way to live, it puts one in the flow of life and gives one joy. The greatest boost to ones self confidence and self worth is to choose to live life by embracing challenge. 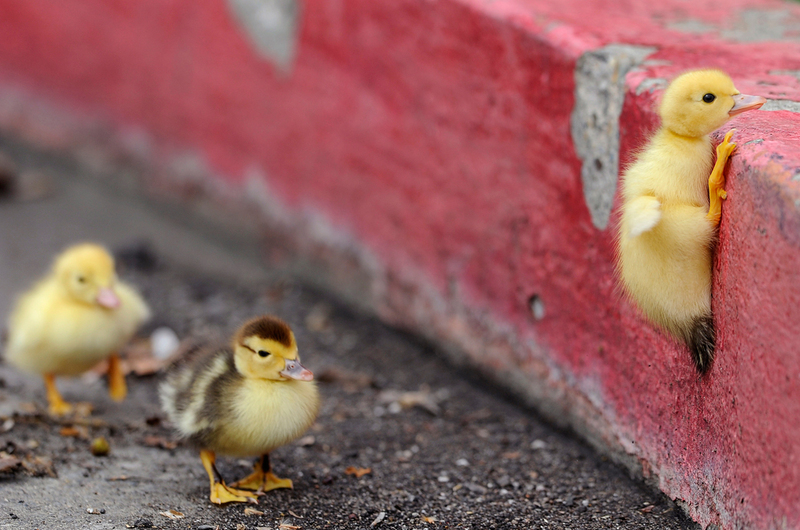 Just like the baby duck in the picture, there is always a way to go around or overcome obstacles and when we do, it is empowering, it makes our spirits come alive. Everyday we are faced with challenges both large and small, do you avoid them or plow on through them or around them or up and over them? They are gifts we have been given on our journey to help us connect with our true being and give us strength. Each time we overcome a challenge a new door opens and our world grows outward and upward and we stand a little more sure of ourselves than before. This frequency challenge we face now is without question, a huge one to overcome, but gather up that that stubborn spirit and refuse to be defeated by the enemy. Where there is a will, there is a way! We will win this battle but we must each change ourselves first before we try to help others change. We must be living examples of the new world we are manifesting that will entice others to want to come along with us and live in their hearts. This entry was posted in Article, Links, reblog and tagged 1 August, 2012, Disclosure, Earth, news, spiritual, Spiritual evolution, Visionkeeper, Where There Is A Will There Is A Way, World. Bookmark the permalink.